Fad diets are fads for a reason: they lack staying power. These trendy diets don’t offer the full range of nutrients or calories that a person needs to stay healthy. Most people who go on a fad diet quickly find themselves back at Square One almost as soon as the fad is declared a success. One major problem with fad diets is that they focus on a very limited range of foods while excluding almost everything delicious and nutritious. A recent update to the American Academy of Pediatrics (AAP) dietary recommendations for children indicates that is exactly how many parents are feeding their children: too many don’ts and not enough dos. Eat something from the five basic food groups every day. Eat a variety of foods throughout the week and the year. Eat fresh foods as often as possible; avoid empty calories in processed foods (avoid cans, boxes, bags, bottles, and other packaging). Learn what whole foods taste like so added sugar, fats, and salt become less attractive. Feed in serving sizes appropriate to the child’s age; a good rule of thumb is one serving is about the same size as the child’s fist. It’s important to remember that the AAP recommendations for food also applies to beverages. In response to over-consumption of drinks that are loaded with sugar and caffeine, many schools have limited the kind of drinks children can bring to school. Water is the healthiest beverage choice for people of all ages but the AAP recommends unsweetened fruit juices, too. Another aspect of the new AAP recommendation is that it calls on parents to become more mindful of what they serve their children at home and send with them to school. Improvements in school meals can only go so far. “Improving child nutrition has to be a community project and parents are part of this community,” he said. When the entire family embraces the total diet approach, without any nutritionally unfounded exclusions or extremes, fad diets quickly become so last year. Nierenberg, Cari. 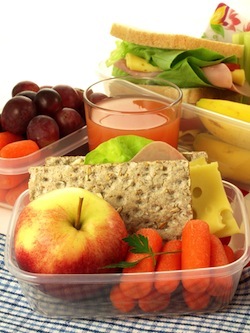 "Pediatricians Encourage Whole Diet Approach To Child Nutrition." HuffPost Parents. TheHuffingtonPost.com, Inc., 23 Feb. 2015. Web. 10 Mar. 2015. "Healthy Living / The 5 Food Groups: Sample Choices." HealthyChildren.org. American Academy of Pediatrics, 9 July 2014. Web. 10 Mar. 2015.